I am hoping to raise some funds for my dear friend and bandmate Cepi Kusmiadi, who's son has been hospitalised for weeks after becoming seriously ill and developing Rheumatoid Heart Disease. Cepi (pronounced Ch-ep-i) and his family live in Denpasar, Indonesia. Cepi recently returned home (after touring with Julian Banks Group in Australia last month) to this family crisis. 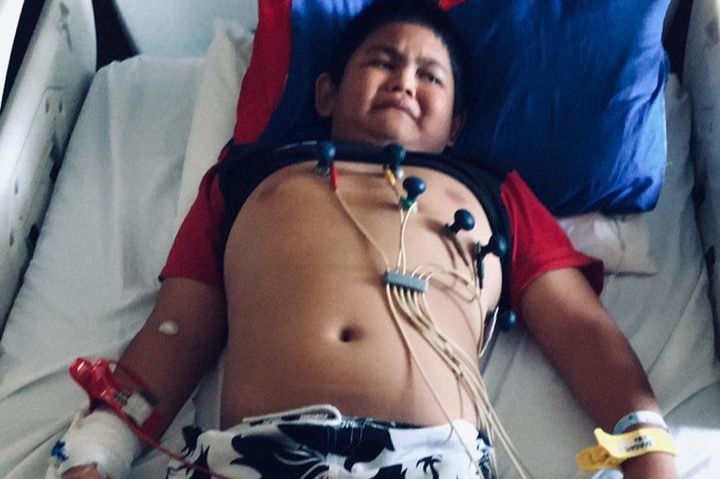 Cepi's Son, 11 year old Muhammad Rayhan Marcerl or Aceng (A-ch-eng) as he is affectionately known, has been diagnosed with Stage 3 Rheumatic Heart Disease - an inflammatory disease with causes lasting damage to the heart valves. This horrible condition occurred following a throat infection and the bacteria (streptococcus pyogenes) made it's way into his bloodstream and to his heart. After weeks of being in hospital on a very high dose antibiotic, Aceng will now need to be on heart medication until he is 18years old. 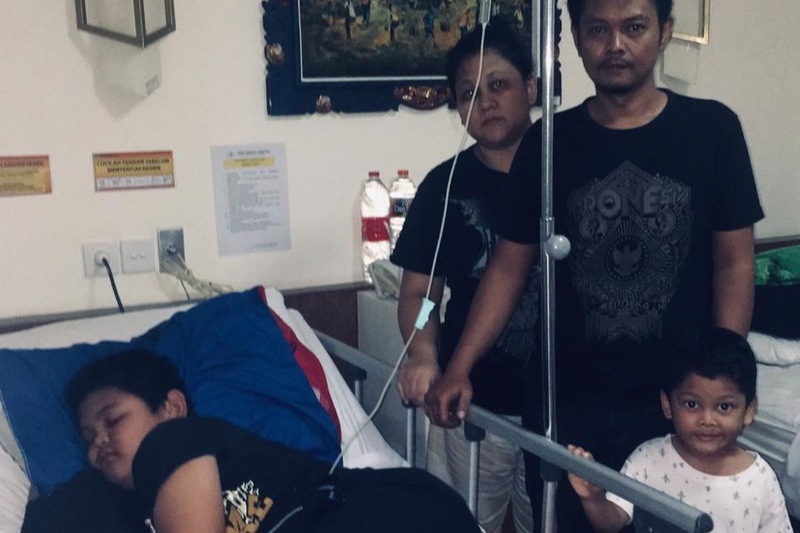 On top of dealing with the emotional stress of helplessly watching his son struggle in hospital, Cepi also needs to cover the medical fees which are only partly subsidised by his government health care. He needs to fork out the equivalent of $3000AUD - and needs to pay it rather quickly... Aceng is set to be discharged from hospital on the 6th of December, although he is trying to set up a payment plan to make repayments easier. Cepi, like me, is a working musician and trying to support his family with the money he earns from teaching and gigs, and this is a massive amount of money to be slogged with. This is the second time Cepi and his family have had to go through a crisis with their beautiful son. When Aceng was only 2 years old he developed a very high fever and was hospitalised. Due to a complication with the medicine he was prescribed, he developed severe and permanent hearing loss. After sustaining his hearing loss Cepi's son began pronouncing his given name, Marcerl, as A-ch-eng...which is how he is now affectionately known in is family. He's a really sweet kid, plays drums like his Dad, and is just super friendly and caring. Cepi and his family are great people and it breaks my heart to see them going through this hard time - I've only just become a father and I can't imagine how hard it is to see your little one suffering like this. There is little we can do for Aceng's health, but if we can help Cepi and his family to cover the cost of this bill that's something! If you are able to follow the link and donate some money it would mean the world to Cepi and his family. and other very special guests! Thanks for taking the time to read this, Cepi hasn't asked me to do this - I just felt like it was the right thing to do! Ps. Here's some footage of Cepi playing with Julian Banks Group last month, he's a brilliant musician. Thanks to everyone for donating to this campaign! It has meant the world to Cepi and his son Aceng... here is a video that young Aceng made to say thanks... sorry for the delay in getting this to you! Thanks to all of you for donating to this campaign - your generosity has been overwhelming! We are super close to reaching our goal of $3k for Aceng, so that Cepi can cover the cost of his treatment... Cepi is over the moon with all this love from Melbourne and Australia! It will be an awesome night of music and I'd like to invite you all to come down - entry is $15 including a raffle ticket - but if you've already donated to the campaign then entry is free - just $5 for a raffle ticket! Look forward to seeing you on Tuesday the 18th of December for a really fun night of music!